We established Peter’s Pressure Washing with the aim of helping our customers to protect their most valuable investment in Riverview, Florida. Your home is probably your single-most cherished asset; thus, it needs the best care and maintenance. Similarly, if you own a store or a commercial building, its upkeep is essential to welcome your customers with a great first impression. Regular cleaning, rust removal, driveway maintenance, and paver sealing helps enhance and maintain the value of your investment for the long run. We expose our homes to various natural and human-made elements including wind, sun, smoke, pollution, and more. These elements can damage your property and take a toll on its value. Conventional cleaning techniques involve a lot of hand scrubbing, harmful chemicals, and wasted time. On the other hand, pressure washing is a safe and affordable solution to remove all the dirt, grime, and mildew from your home’s exterior. Give us an opportunity to spray our magic on your homes. Pressure washing will boost the value of your home, freshen up its appearance, and make it easier to sell down the line. Not only does a clean home improve curb appeal, but it also offers a healthy and safe environment to live in. Whether you own an asphalt or concrete driveway, it can get damaged due to constant wear and tear. You might notice pavement cracks that allow dirt and debris to go inside. These cracks permit weeds to grow as well as make the cracks spread faster, thereby causing further property damage. Our experts will handle your driveway cleaning with the utmost care and professionalism. We’ll remove all the oil and dirt stains, leaving you with a clean, beautiful, and crack-free pavement. If you’ve booked a regular pressure washing service for your roof, cancel it right away! High pressure can wipe out the granules from asphalt shingles, which are essential to protect your roof against the sun, wind, and rain. Instead, book our expert low-pressure cleaning solutions to remove the algae and moss, while protecting your roof shingles. Backed by our worker’s compensation insurance, our services are affordable, high quality, and trustworthy. We assure a long-lasting roof and also help in reducing your electricity bills. Plus, we don’t use any chemicals that will damage your flower beds or grass around the home. Pavers may not need extensive maintenance, but they do need some care and attention to ensure durability. When you clean and seal the pavers, you prevent permanent staining or discoloration – and provide better visual appeal and value for your property. 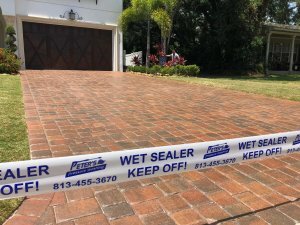 Call our experts at Peter Pressure Washing to maintain your interlocking concrete pavers. Rather than opting for age-old solutions like acrylic sealers or water-based sealers, we bring you an exclusive Seal ‘N Lock advantage. This process is a stable, durable and adhesive formula that contains UV radiation inhibitor and mildew, algae, and mold inhibitors. Our method of paver sealing involves two coats. The first is floods the joints with large volumes of sealer, while the second coat enhances and protects the paver surface. As a result, you find a non-toxic solution for paver restoration from Peter’s Pressure Washing. 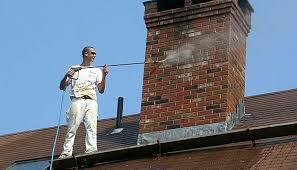 You can also contact us for window cleaning, gutter cleaning, travertine sealing, and rust removal. Building managers, store owners, and industrial property managers often face the challenge of maintaining their retail spaces. Due to the large volume of car and foot traffic, there is bound to be a lot of damage to external surfaces like storefronts, parking lots, garages, entryways, etc. Many walls are also defaced with graffiti, ruining the look and feel of your business. And ever thought about the growing rust around your commercial spaces? Whether it is because of an overflowing pipe or buildup from rain, rust can be unappealing and unsafe, too. How do you maintain your commercial property to attract more customers? Can you get an affordable solution without breaking your budget? Only with Peter’s Pressure Washing. We offer a wide range of commercial pressure washing services, including rust removal from all surfaces, spray paint removal, building power washing, and parking lot and garage cleaning. Our specialists can clean small to huge spaces, ranging from 50,000 to 150,000 square feet in one single night. We come equipped with heavy-duty commercial grade equipment, non-toxic and safe chemicals, and high-class professional gear. Not to mention, all our team members are experts in commercial property cleaning, assuring you of the best results. Call us for a free estimate today and see how we can transform your building for better business! If you’re an investor, property manager or a homeowner in Riverview, we request you to try our pressure washing services for your building exteriors. No matter how stubborn the stain, our experts will get rid of it within your timelines and your budgets. So why wait? Contact us right away and schedule an appointment. I called Peter’s Pressure Washing and was immediately given an appointment that day! The men arrived on time in a well labeled truck. They did a fantastic job pressure washing my driveway and sidewalks. Very professional and great price. I am extremely happy with the results. I never thought I'd see my porch/walkway get this clean. It looks like it did 15yrs ago when I bought my home. Thank you! 2 thumbs up and I'd give more stars if I could! Peter's pressure washing offered top notch service from initial contact and after work was completed. I am very satisfied with their service. Yes, you may be able to find a random pressure washing company on Craig's list for $20 less, but quality of work, services and professionalism are 10/10 with this company. From the time we called them to set up an appointment to the time the job was complete it was a wonderful experience. We had the driveway, entryway, public sidewalk, lower areas of the house and the back porch spray washed. 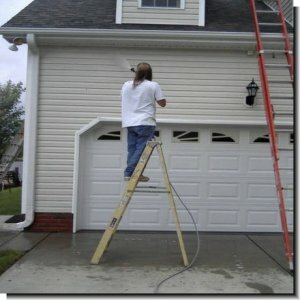 I would and will use Peter's Pressure Washing again and will recommend them to my friends and family. Peter and his crew were fantastic. I highly recommend them! 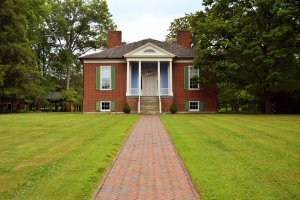 They did an excellent job cleaning our three-story log house, detached garage, driveway and stone fence columns--all for a reasonable price. They were polite, professional and punctual. What an AMAZING job Matthew did Wednesday morning on my driveway pavers. And what a PLEASANT specialist to work with. If you have signs for advertising in my yard I would be happy to give my approval. My pavers look better than when they were first installed, almost 4 years ago. You truly are PROFESSIONALS! Peters pressure washing was great! Kevin gave me a quick quote over the phone and they were out by the end of the week! The men that came out did a great job and even came back when I saw a couple spots after it dried for no charge! Very nice company and people! As a Realtor I will be recommending to clients! They did such an excellent job pressure washing my pool cage and furniture that I called them again today to do the windows of my house. I did not realize how much they are capable of and how professional everyone is and when they leave, everything is immaculate. Very happy to have found this company and will be calling them again soon for my gutters.